Description: The life-size bronze sculpture of Queen Charlotte stands in a garden along with sculptures of two of her dogs. She is depicted wearing a long-sleeved gown with petticoat and train and holds a small bouquet of flowers in her right hand. On her right wrist she wears a bracelet with a cameo of her husband, King George III of England. One dog playfully jumps at the hem of her dress and the other stands amidst the plantings staring back at her with a look of devotion. An inscribed plaque is set in the brick walkway beneath the raised garden bed. Subject notes: Queen Charlotte, also known as Charlotte of Mecklenburg, was the queen consort of King George III of Great Britain, and is the namesake of the largest North Carolina city, Charlotte, and Mecklenburg County where the city is located. She studied botany and was a patron of the arts. 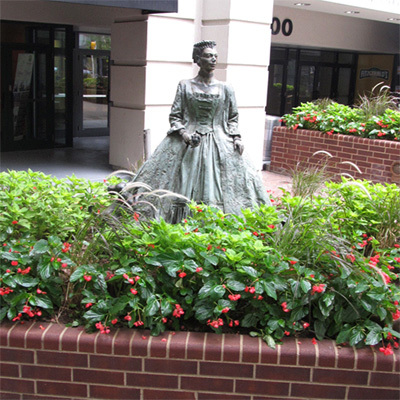 Location: The sculpture sits in front of the entrance to the World Trade Center on North College Street at the corner of East 5th Street in Charlotte. It faces the street. Landscape: The sculpture sits in an hexagonal raised garden composed of brick and containing seasonal plantings. It is surrounded by other raised beds containing seasonal plantings.